Finally ending all speculations the Peoples Conference chairman Sajjad Lone decided to join the fray by announcing to participate in parliamentary elections few days ago in a press conference at his residence. Whether it is going to yield something positive for the people of Kashmir if he wins will come to fore automatically. If he is able to get elected to the Indian parliament, which according to him is ‘change of strategy not ideology’, his own work will judge him what his intentions were. Sheikh Abdullah the ‘tallest’ leader of Kashmir and only leader who enjoyed influence in every region of Jammu and Kashmir left the ship midway still the resistance movement of Kashmiris for their inalienable and birth right of self-determination didn’t fizzled out and later infact became strong enough to challenge the hegemony of India. As the movement for Independence is always bigger than any individual and remains alive and kicking as long as sentiment is alive in the hearts and minds of people. Elections in Jammu and Kashmir have always been a hectic affair for the government of India with ‘separatists’ by and large calling for boycott of elections under Indian constitution and ‘mainstream’ leaders naturally busy in wooing the voters to vote for them in lieu of basic amenities. No leader of any shade of opinion has ever dared to seek votes for the ‘integration of Kashmir with Indian union’. Whether Assembly elections or Parliamentary elections it has been an accepted fact by all that these elections have no bearing on future status of disputed territory of Jammu and Kashmir. As U.N resolutions have already stated that State Administration can’t take any decision which can have any impact on future status of Kashmir. And India’s First Prime Minister Jawaharlal Nehru himself declared in Indian parliament that Indian parliament can’t take any decision on behalf of people of Kashmir. Boycott call given by pro-freedom leadership infuses fresh oxygen to the election campaign of ‘mainstream’ leaders and lends it more credibility. And claims of pro-freedom leadership that makes boycott only way to respect the sacrifices of martyrs and vindication of pro-freedom sentiment allows New Delhi to manipulate this to hoodwink international community using its biased media which always shows long queues of people waiting for their turns to cast votes and sells this to out side through its strong propaganda mill as rejection of ‘separatist’ ideology and acceptance of its ‘democracy’. The only logic that elections in a disputed territory (Jammu & Kashmir) under its occupants (India) constitution will legalize its hold can’t be the justification for ever to remain away from polls as it has to be seen through the prism of its merits and de-merits. As disassociation from elections makes this battle exclusive only for collaborators who represent India in Kashmir and leaves no option for people other than to turn to them for at least basic amenities which makes them relevant and their existence a necessity. They enjoy perks and privileges of power without any real fight from any quarter. The national struggles take natural course and ends only after its logical conclusion it can take from few to even hundred’s of years till then people have also to live as well which can’t be possible without basic amenities. Half of pro-freedom leadership can join the fray and rest can continue to take this resistance struggle forward. There is no need for hundreds of parties propagating the same cause. Even if half of pro-freedom leadership doesn’t participate directly in elections at least they can identify honest and upright people so that they can participate in elections to undo the wrong committed by ‘mainstream’ leaders so far, they can provide some sort of relief to the people, check the exploitation of our natural resources particularly of water, get the state back on the track of development. For this an amicable environment needs to created so as to make this task easily. It has to be introspect by all as when every time this nation comes close to success in denting the colonial hegemony some thing unusual happens and entire movement either gets derailed or fizzles out. We have to learn from the mistakes committed not only during the mass movement of 2008 due to which it couldn’t be converted fully into peoples revolution but it has to be seen why the revolution of early 90’s lost the track only after two years of its commencement. 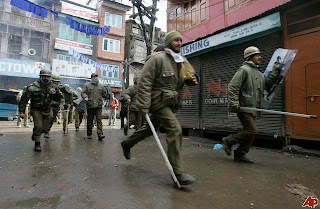 Movement can’t be sustained only by strikes and stone pelting substantial things needed to be done. Conviction, dedication and commitment are the essential ingredients of any liberation struggle and if a workable and farsighted strategy is added to it can be converted in to a success no matter how much strong an occupying power may be. India is trying hard to equate our struggle with that of Al-Qaeda and Taliban to garner support of west but our struggle is a national liberation movement poles apart from Taliban aimed to achieve complete independence and reunification of our forcibly divided parts of Kashmir. This refers to the news report of some agencies that Taliban may have reached to the Kupwara forests. It seems to be a well calculated move by India to malign our genuine freedom struggle by associating it with that of likes of Taliban and Alqaeda. Our struggle is a resistance movement based on U.N resolutions which are near about 18 in number passed by U.N Security Council to which both India and Pakistan are signatories and world witness to them. Even those who have taken up arms have declared to fight under the Geneva conventions and have restricted their fight with India within J&K. India is trying hard to equate our struggle with that of Al-Qaeda and Taliban to garner support of west but our struggle is a national liberation movement poles apart from Taliban aimed to achieve complete independence and reunification of our forcibly divided parts of Kashmir. These kind of false notions are being spread to justify the presence of 7 lakh troops who have been empowered by draconian laws which provide them total impunity from the law of land. Which is the root cause of human rights violations by these so called security forces. The wanton use of force and arm twisting methods employed during previous elections may be used again for the parliamentary elections but these kind of cheap tactics won’t be able to break the will of valiant Kashmiris who have been fighting for their inherent, internationally recognised, pledged, fully deserved and unfettered right of self-determination. Elections or no elections won’t change the future status of Kashmir dispute as elections in real sense are meant for the development issues only. The more India will use force to crush the movement of Independence aimed actually to remind her of its own promise from which this “world’s largest democracy” backtracked upon the stronger will be the resentment and will of Kashmiris and history bears testimony to this fact.